Indie pop artist turned stadium-status superstar Halsey returns to deliver her sophomore studio album, following up 2015’s lacklustre Badlands. Since being featured on one of the biggest songs of all time, The Chainsmokers’ “Closer”, Halsey’s place in the public eye has grown exponentially and this album drops at a very opportune time for her. Halsey has perhaps deservedly drawn some negative ire for her recent comments on her placement in the musical world, seeing herself as alternative and countercultural. She criticized the public naming her a pop artist and stated her belief that urban artists who do pop features don’t get the same treatment. However, we have to separate the music from these comments a bit. hopeless fountain kingdom is a spectacular and surprising pop album and a major improvement from Badlands, and I can always appreciate a bit of a story tied in. Halsey has certainly learned from her mistakes here and dropped one of the best pop albums of the year. Halsey has really assembled the best possible team she could here — the writing and production are both very strong. The album is unified by the darker sound and aspects of her indie past that Halsey kept, but there is enough variation in the pop elements that have begun to creep in that it stays interesting. When those horns came in on “Alone” after the first two tracks gave me some nice harmonies and then a big trap beat, I was sold. The project is essentially divided into quarters between 4 big pop producers – Lido, a big contributor to Badlands, dance-pop auteur Ricky Reed, emotional balladeer Greg Kurstin and Benny Blanco, who brought his frequent collaborator Cashmere Cat along to explore his more experimental side. Some fellow pop artists on the darker side of things show up in the writing column as well – The Weeknd, Sia, and Phantogram’s Josh Carter. Halsey knows how to use her haunting, somewhat creepy vocals to her advantage here, mainly through her lyrical content. One of the main problems with Badlands was a feeling of disconnect from the lyrics, proclaiming in its biggest hit that she was “raised on Biggie and Nirvana”. The winding, loose story of star-crossed lovers here is very believable and makes a lot more sense. Halsey even opens the album with a monologue from Romeo and Juliet. This is how to do dark pop effectively. Linking up with people like The Weeknd was a great decision, coming across on the incredible “Eyes Closed”. Halsey delivers a heartbreaking and instantly catchy chorus over a huge hip-hop inspired beat from the dynamic duo of Blanco and Cashmere Cat. Halsey’s music is very large-scale and cinematic, which is why inclusion of a story strengthens things. Her understated voice is a good contrast to the gargantuan production that frequently surrounds her. “Bad At Love” is another standout track, as many great aspects link together perfectly: That deceptively cheerful piano instrumental. 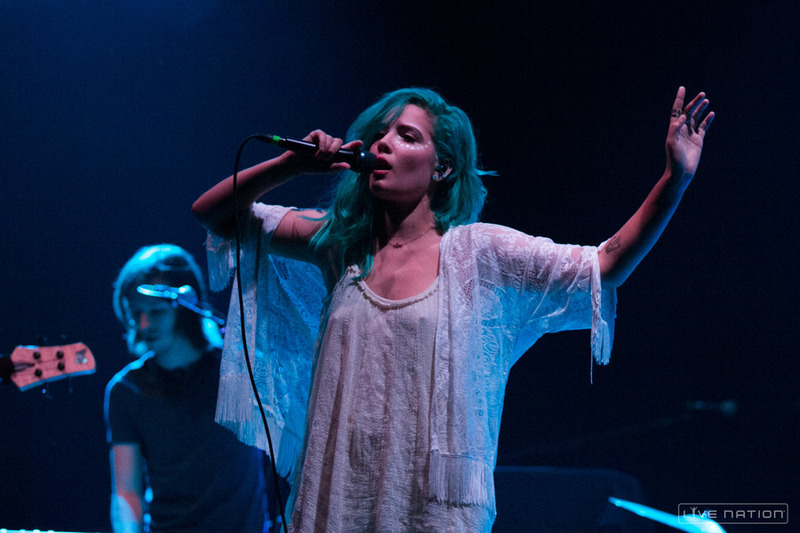 Halsey’s rapid-fire vocals. The refreshing lyrical themes, which address her failed relationship with a man in the first verse and a woman in the second – all of this builds up to her biggest chorus yet. This of course leads into “Strangers”, the highly publicized collaboration with Lauren Jauregui of Fifth Harmony, also bisexual. Their voices fit together better than I could have ever imagined, and as they harmonize about a lesbian relationship losing connection over a pounding synthpop beat, it paints the most vivid picture yet of the album’s storyline. Although Halsey has certainly learned to play to her strengths here, I can certainly see where some of the criticism is coming from – there is some pretty heavy borrowing of some other popular aspects here. I believe that Halsey has injected enough of her own personality for this to be hers and hers alone for the most part, but when we get a radio single like “Now Or Never”, you begin to get a bit skeptical. The track sounds a little too similar to Rihanna’s “Needed Me”, and even shares a writer in Starrah. “Sorry” is the only time when Halsey slows things down here – it is also the only time she doesn’t get primary writing credit, going instead to producer Greg Kurstin. It’s painfully obvious that it’s a throwaway from Adele’s 25, the album that he masterminded. In addition, the album is 13 tracks long and doesn’t even run for 40 minutes, as some tracks like “Lie” and “Walls Could Talk” are much too short and never really elaborate on some great ideas. Halsey will always be a somewhat polarizing artist, but great pop music is great pop music. To improve so much on a sophomore album is quite impressive, and I’m sure she’ll only continue to discover her own sense of artistry as her career continues to progress.